Slam, Bam, Can I Have Another Quarter Madam? No, I'm not talking about some kind of quarter eating, cheap hotel, vibrating bed here, I'm talkin' pinball. Quarter starting, plunger pulling, flippers flipping, target hitting, table whacking, mode activating, slam tilting pinball. Pinball games seem to be as old as graphics cards. As soon as they figured out how to draw lines with pixels, some one made a pinball game. These days it seems that digital pinball games can go in one of two directions -- pure fantasy or virtual reality. The pure fantasy tables try to take pinball into new direction by making table that could never exist in real life. The other ones are some sort of pinball sim. Creating an digital version of reality with the best elements of the wood, metal, flashing lights, glass and steel balls from the real world. Slam Tilt is a pinball sim and that's what you would expect from 21st Century. 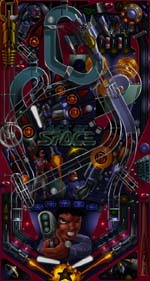 Since their beginnings, 21st Century has concentrated on bringing real life pinball physics and game play to the computer. Slam Tilt is no exception. The tables in Slam Tilt are not modeled on real tables like Amtex's Royal Flush which is probably a good thing. A software based table allows for much more special effects and last minute adjustments then the production of a real physical table. 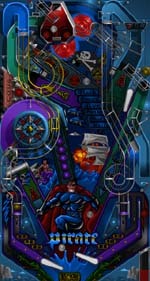 In case you are not aware of Royal Flush, it is part of a series of pinball games from Amtex that are based on original classic tables -- electro-magnetic tables.. Amtex's Royal Flush was very realistic and true to the original table but unfortunately the original table is boring compared to today's full digital tables. Slam Tilt's four tables on the other hand are full of great surprises to keep you interested. There are 42 challenges in Slam Tilt's four tables. Mini-bonus rounds which are the secret to high scores and free balls. Usually these bonus modes are triggered by a serious of events -- dropping a row of targets, spelling out a word or locking the ball. Once activated the digital score board provides the fun. For example on one of the best tables "Night of the Demon" has at least 13 modes including witchcraft mode, grave digger mode, bat butcher mode, no brain no pain video mode etc. Once activated, a mode can lead to major points if you hit the lit ramps or targets. For example in the "Bat Butcher Mode", sending your ball up the lit ramp will fire a shotgun at the attacking bats. "Grave Digger" involves finding the coffin filled with gold. The manual does an excellent job of explaining all of the bonus modes and is written in several languages. Slam Tilt's other three tables have a car race theme (Mean Machines), a swashbuckling theme (Pirate) and a space theme (Ace of Space). Not highly original but well executed never the less. The game is played on about a third of the screen so the dreaded scrolling is minimized. Gameplay is controlled by the shift keys, space bar, arrow keys and the enter button so this game really lends itsself to laptop gaming. Slam Tilt arrived just before I had to make a series of three business trips all involving more then 3 hours of flight time. If you are a frequent traveler you'll know that they don't change the inflight movies but once a month. Luckily I had Slam Tilt to keep my mind off of the turbulence, the screaming baby in seat 24A and the terrible food. Now if they could only improve the battery life. Since I enjoy pinball in all forms, I have a few other games to laying around to compare Slam Tilt too including some of 21st Century's earlier titles. 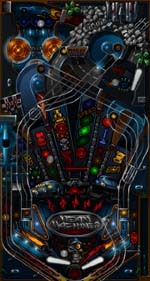 21st's pinball games have always been fateful to the physics of a real silver, Slam Tilt improves on the graphics and adds many more complex "modes" to the gameplay. Slam Tilt does pale somewhat in comparison to Hyper 3-D Pinball. Hyper 3-D has a superior table view and audio. 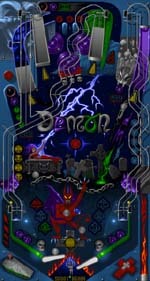 Slam Tilt is a fine pinball game for pinball and arcade fans. The tables will provide hours of enjoyment and challenges although the value of this collection with only four tables may not compare as well so some titles such as Hyper 3-D Pinball which includes 6 tables. Sound effects and audio are a bit limited compared to games such as Full Tilt!. Ok. Lots of bonus modes. Only four tables. Box hoo hum but the manual is very complete with all the table explanations. Takes a long time to load when you start it for the first time. Copyright © Edward Fielding for the Games Domain Review, February 1997. All rights reserved. Not to be reproduced without permission.